SCR24 ERDEY ROADS/HIGHWAYS - Requests DOTD to study improving LA 22 to three lanes between Springfield, LA, and I-55 in Tangipahoa Parish. SCR25 ERDEY ROADS/HIGHWAYS - Requests DOTD to study improving US 190 to three lanes between LA 16 and LA 63 in Livingston Parish. SCR26 ERDEY ROADS/HIGHWAYS - Requests DOTD to advance the project to construct roundabouts on LA 1026 at its intersections with Dunn and Eden Church Roads in Livingston Parish. 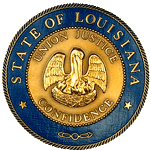 SCR31 ERDEY ROADS/HIGHWAYS - Requests DOTD to study improving the LA 1020 Bend Road Bridge in Livingston Parish.